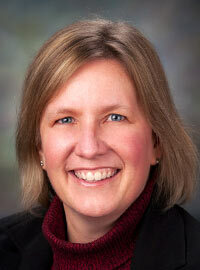 Brenda Lantz was recently named associate director of the Upper Great Plains Transportation Institute. Lantz, with more than 20 years of experience on the UGPTI's research staff, will help lead the UGPTI's research, education, and outreach activities. She will assist in managing and promoting the institute while working to improve coordination among the institute's centers and encouraging greater synergy among staff. Lantz joined the institute as a graduate research assistant in 1990. She is currently an associate research fellow and program director of the UGPTI's Transportation Safety Systems Center in Lakewood, CO. Her research focuses on intelligent transportation systems for commercial vehicle operations, business logistics and commercial vehicle safety - subjects on which she has authored and presented numerous articles. The previous associate director, Denver Tolliver, was named UGPTI director in March.